Three very persuasive women one being my wife.. starting this venture has taught me so much about my heritage, my culture, my mother & fathers place of birth. 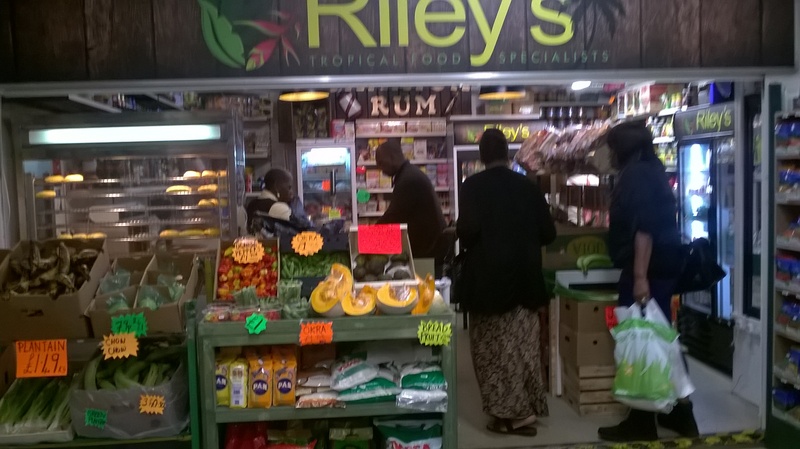 Riley’s is a tribute to my late mother (being her maiden name) we try to source all our products and produce from suppliers that deal directly with farmers and producers in the Caribbean & Africa. In promoting authentic products and produce we have educated ourselves as its not until you start to look into the source of products you realise that the Caribbean market is flooded with imitations which does not help the economies in our Caribbean & African countries where it is most needed. Why do you love the market? We at Riley’s are not only a team we are a family quite literally myself – Michael, my trouble and strife Julie, Patsy my fantastic sister and two of our crazy friends… Then all singing and dancing Cheryl, who is currently taking bookings for weddings and bar mitzvahs (she really is a fab singer) and my primary school classmate Amanda , although she claims to be 10 years younger than me!!!! (I have school photos available at a price!!!). Market life is ‘no two days are the same’. All at Riley’s enjoy every aspect of market life especially the interaction with our wonderful customers both young and young at heart. Some only pop in for a plantain or three but often stay for chat. Being part of Luton market is being part of a community, we may all be individual businesses but we are united in giving all our customers the most diverse and friendliest of shopping experiences.